A RUP LIFE: Disney Villians The Evilest Of Them All Book Review & Giveaway! Disney Villians The Evilest Of Them All Book Review & Giveaway! 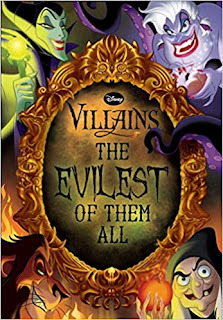 I love all things Disney and I was super excited to receive Villains The Evilest Of Them All Book to review. This is sort of a scrapbook with movie pictures, stats of the villains and even pull out pages. The Villains all hold a sort of conversations with their evil associates talking about their stories. This book is so much fun! Reading from the other side's perspective is so very entertaining. We all know a well written bad guy makes the story so much better and it is nice to have something that features these amazing characters. It is too hard to pick my favorite villain but it really cool to see them all included in this gem of a book! WIN WIN WIN One lucky reader will win a copy of Disney Villians The Evilest Of Them All! !